As I said in the last post, little by little we are now going to start getting eurozone data. Today Eurostat released the August new industrial orders data. The euro area1 (EA13) industrial new orders index2 rose by 0.3% in August 2007 compared with July 2007. The index fell by 2.6% in July3. EU271 new orders increased by 1.0% in August 2007, after a decrease of 3.5% in July. In August 2007 compared with August 2006, industrial new orders increased by 5.1% in the euro area and by 8.2% in the EU27. In August 2007, among the Member States for which data are available, total manufacturing working on orders rose in seventeen and fell in three. The highest increases were registered in Poland (+81.6%), Hungary (+33.3%) and Lithuania (+28.2%), and the only decreases in Denmark (-18.4%), Italy (-1.8%) and the Netherlands (-0.4%). What stands out here is the clear difference between Western and Eastern Europe. Eastern Europe is still accelerating - overheating considerably some would say - while Western Europe is slowing visibly. 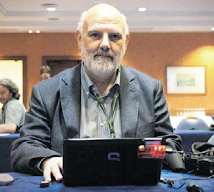 Among the eurozone countries which are most notably slowing at the moment I would single out Italy, Germany, Greece and Spain for rather close attention. 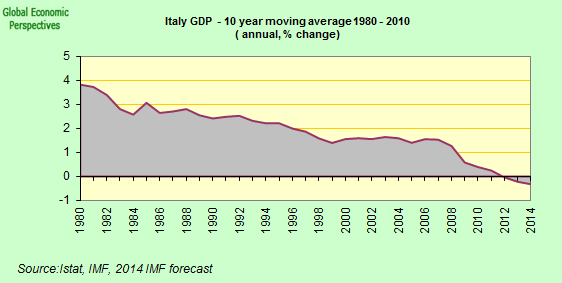 Germany and Italy have long had their growth ups and downs, which have in the last decade been more downs than ups, but Greece and Spain (two of the three construction boom countries, the other being Ireland) have normally maintained a fairly strong profile through the downturns, and this has tended to take some of the edge of the recent weak periods. This time it may well be different, since the construction driven economies may well be even more affected than the "usual suspects", something which makes this downturn an even more problematic one. Now if we look at the evolution in orders in recent months, we can see that everyone has been slowing to some extent (less growth, rather than outright contractions) and the German case particularly stands out for the much lower rate of expansion in new orders following the very good period earlier in the year. If we look at the month on month changes, I would single out just how evidently Spain has been slowing, and the strong underlying weakness which is being revealed in Greece. Italy as we can see has shown virtually no increase in the level of new orders since the early summer. 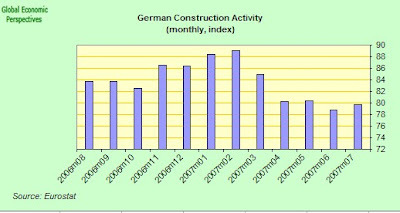 The general German picture is only confirmed if we look at the data released today from the Federal Statistics Office which shows that building activity in Germany decreased 4.4% in real terms in August 2007 when compared with August 2006. As reported by the Federal Statistical Office, the total price-adjusted value of orders received by building construction and civil and underground engineering enterprises in Germany decreased 4.4% in real terms in August 2007 from the same month of the previous year. In building construction demand slumped 7.6%, in civil and underground engineering it fell 1.3%. The number of employees amounted to 713,000 at the end of August 2007. That was a decrease of 28,000 (–3.8%) compared with August 2006. This situation is clear enough if we look at the chart for German construction activity since the end of last year, using the Eurostat monthly data which only runs to July (ie to before the "financial turmoil" of August). The slowdown from the previous boom is clear enough. Now it only remains to be seen how far it goes. This situation in Germany is, at the end of the day, quite important for Italy, since Germany is an important customer for Italian exports.